...I too went looking for a 415, apparently it's rare or no one is giving one up yet. Drat! From Seiko's website I thought it would still be available, new manufacture. That explains why I can't seem to find one, and reminds me of a search issue with Google that plagued a company I used to work for. People kept trying to order products that were no longer available, and when I inquired, invariably they said they found them through a Google search. I got in trouble with the company when I told the customers not to use Google and a Google rep found out about my comment. I told my company that I'd stop giving that advice to customers when Google stopped giving out bad information, but it looks like nothing changed. Since there is no obvious link on Seiko's website to the Seiko 5 watches, does this mean they're all out of production? I know this watch is a lot bigger than what I wanted (42mm vs 38mm) but does anybody know how to find one? It's a 50th Anniversary Seiko 5, model SRP415K1. Priced right, I'll risk it being too big. Sadly, none come up for sale on WUS either. Thanks, rmd. I looked there, too, but I appreciate the back-up. Originally posted by newtoSig765: Since there is no obvious link on Seiko's website to the Seiko 5 watches, does this mean they're all out of production? I recently picked up a Seiko SKX007 and took off the bulky rubber strap and swapped it for a black nato. I think its the perfect "beater watch"
Good Lord, that's a big watch! That's where I first saw the one I like. No link to sales or pricing, and as rmd and SC have both said, they can't find one, either. That's why I was grousing about Google searches in an earlier post, thinking that link may in fact be to what is now not current. 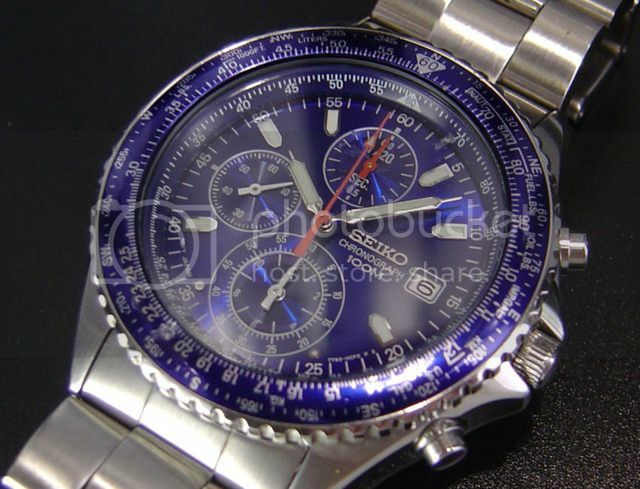 Also, many of the watches I see by searching for Seiko 5 Sport appear to be in production, but not on that website. I may try to call their US customer service number tomorrow if I get a chance. That's where I first saw the one I like. No link to sales or pricing, and as rmd and SC have both said, they can't find one, either. ...I may try to call their US customer service number tomorrow if I get a chance. If you're interested in a new one, I can check at the Seiko factory outlet store near me and get back to you with availability and pricing. In all honesty I'm starting to suspect that it will be out of my price range, but there's only one way to tell. SC and vthoky both expressed interest, so if they have it or can get it, keep them in mind as well. Agreed. I keep a 009 for that very purpose as well. I called Seiko this afternoon, and talked to a very helpful person in Customer Service who said that the website we've been looking at is part of their international product line, not available in the US. She checked specifically for the SRP415K1, not available here. She volunteered that if I managed to get one from overseas, that Seiko USA would work on it and honor the international 1-year warranty, a pleasant surprise compared to my investigating greymarket cars and cameras in the past. Anybody know a reliable website for Japanese Seiko's? My quick check of Google only led me to a couple websites that don't search very well in Engrish.